You know all those fancy gaming tables that the most dedicated of board-gamers have? The ones that are the cost of a small car and the size of a horse’s coffin? I always wondered why they had a recessed playing area – it seemed uncomfortable and awkward, like playing poker on a pool table. It looked like you’d need to be constantly reaching down into a pit of crumbs and sorrow to engage in even the most perfunctory way with the game you were playing. I don’t wonder about the recessed area any more. I get the cube part. Not sure where the quest is. 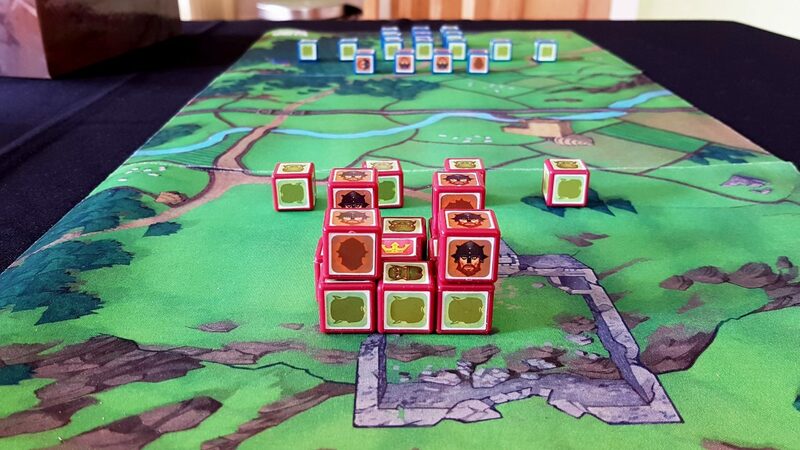 Cube Quest is a likeable game but if you play it on a normal dining table you’ll spend as much time searching the floor for game pieces as you do taking part in the fun. It’s a two player dueling game that combines physical position with all the precision of a game of pool. 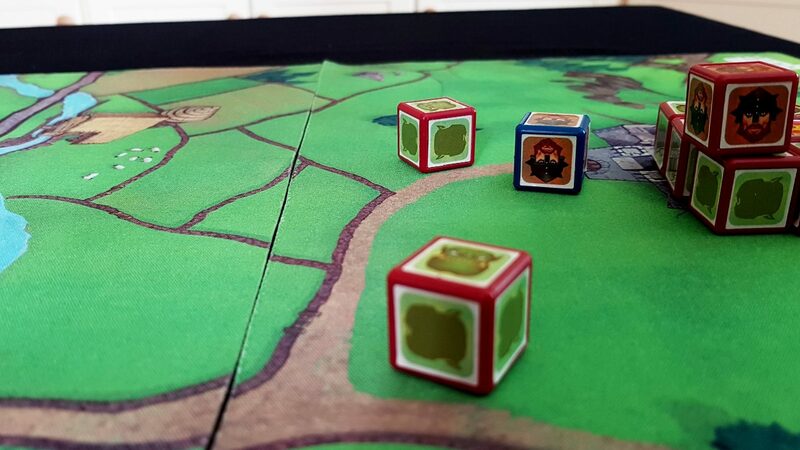 You’ll find yourself orbiting around the table, examining each cube in exquisite detail for the best angle of attack. If you’re playing on a flat surface you’ll also find yourselves positioning yourself opposite your opponent like you were a nervous goalie. You spend considerable time and energy hoping to catch a cube before it and everything around it goes ricocheting under an appliance. That could be extremely aggravating were it not for the fact you’ll most likely be laughing like an idiot when you’re trying to reclaim it. 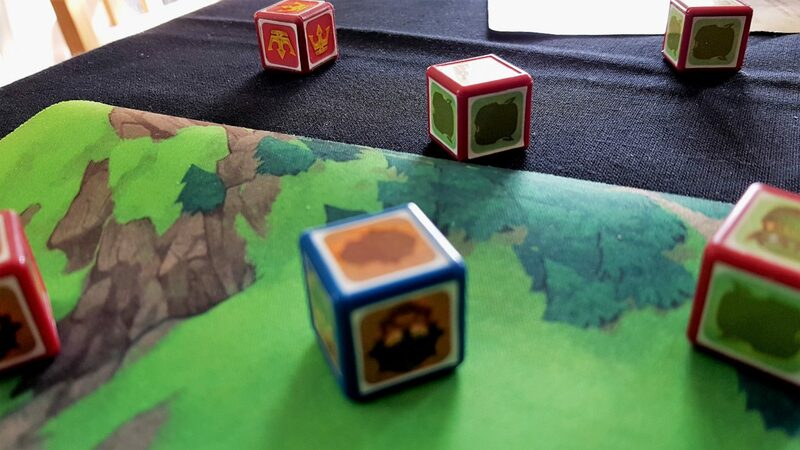 Cube Quest is a game where schadenfreude, humiliation, and karmic balancing all come together and entwine repeatedly over the course of ten or so minutes. 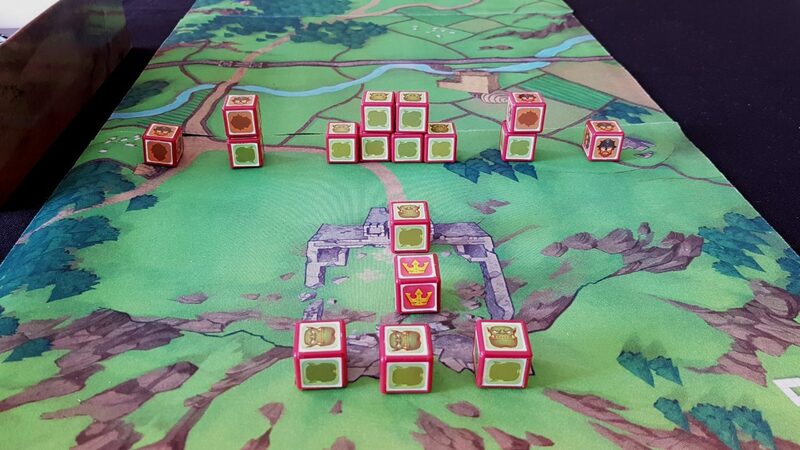 As part of the game you lay out three neoprene mats to represent the territory of battle. There are two castles on opposite ends of the terrain, and a wall in the middle that represents where our territory becomes their territory, and vice versa. 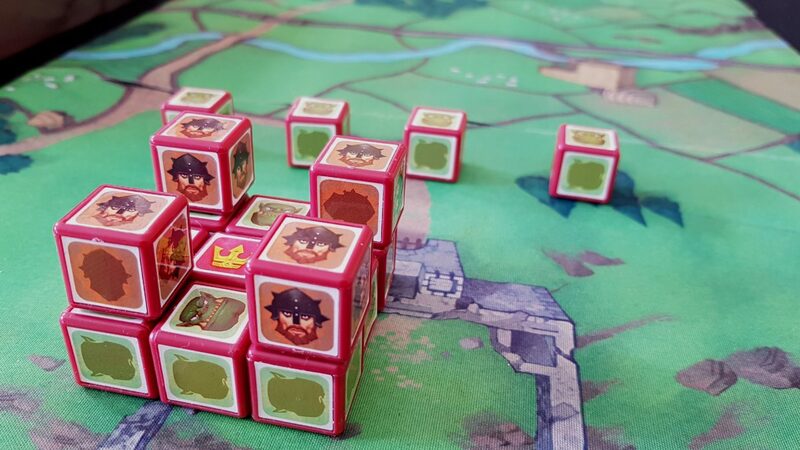 Then each player takes a handful of cubes, either the ‘standard army’ or a bespoke army built up from a point allowance. Your king has to be somewhere in the castle. Your pieces have to be somewhere in your territory. And that’s it! Everything else is your own little sandbox – you can build cubes, or towers, or formations. 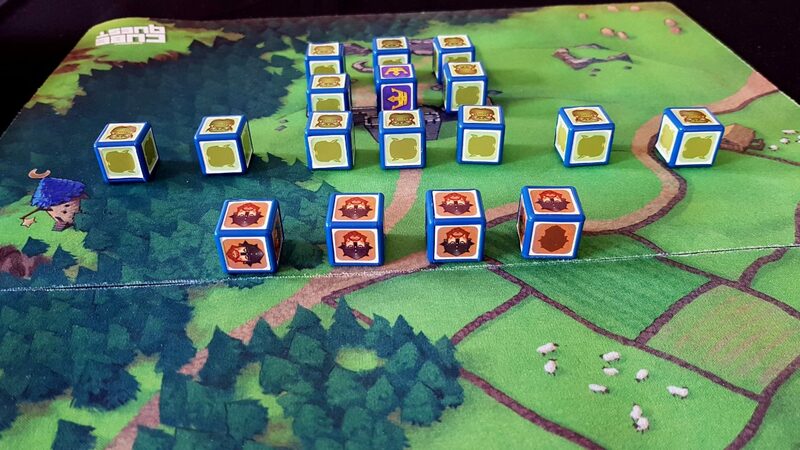 You can distribute your troops wildly around your terrain, or clump them up. You can focus on dispersal – creating a loose-knit web of troops that contains no obvious point of maximum leverage. Or you can build walls that create juicy targets but have the heavy inevitably of physics behind them. And if you have any sense at all, you’ll be doing that behind a partition wall so neither player knows what the other is constructing. I’m not going to pretend that you’re going to be doing anything particularly clever here – there are fundamental limits to how inventive you can be with cubes and the laws of momentum. It’s not a deeply expressive system but it’s fun nonetheless. You can have a tight regiment that makes frontal attack useless. Or maybe you want to put your toughest fighters up and front, with your grunts serving as shield and arrow fodder. 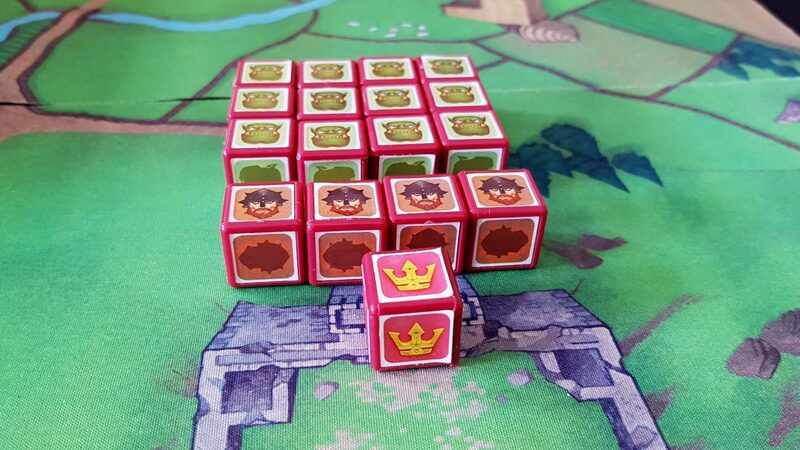 Maybe you want a line of cubes at the back to absorb any impact against your king? Maybe you want something a little more inventive? 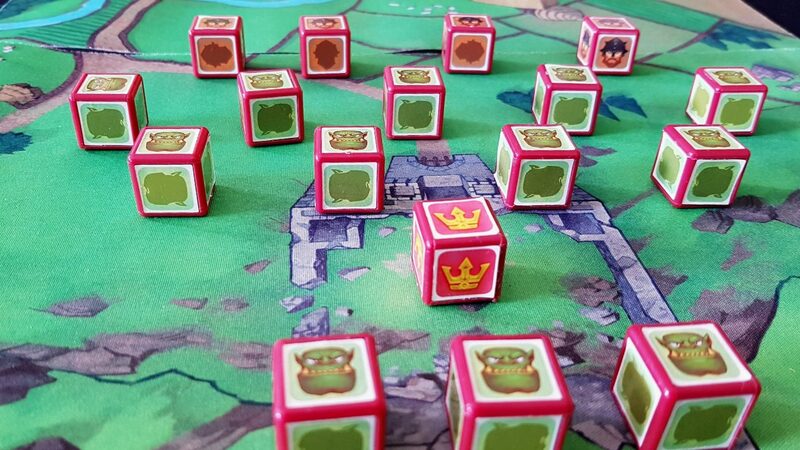 Or maybe you fancy the kind of thing that’s going to limit your ability to attack, but will seriously hamper any chance your opponent has to knock your king off the mat. What are you cooking up over there? … without any idea of what your opponent is building. This creates a great revelatory moment of anticipation. You lift the box to reveal the formations that had hitherto been hidden and then you stare aghast at the horrors your opponent has arrayed before them. That’s disappointing. Where’s the heart? Doing it this way means that you can’t rely on the situational knowledge that comes from seeing a defense being constructed. That avoids the ‘rock paper scissors’ style of reactive tailoring, and speeds up the whole process considerably. Technically this is part of ‘advanced play’ but you really should do it from game one if you want to get the best out of the box. Can you get your fingers in there? Asking for a friend. 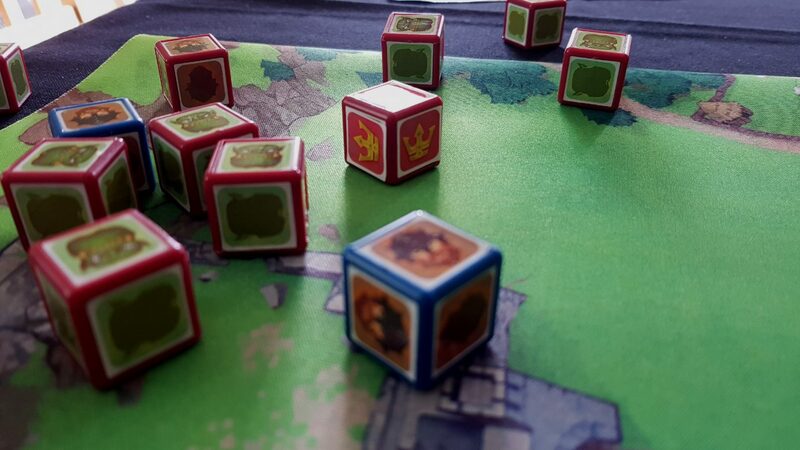 Once you’re both ready you start the battle, each player in turn choosing a cube and flicking it against the enemy forces hoping to knock the king off the map. 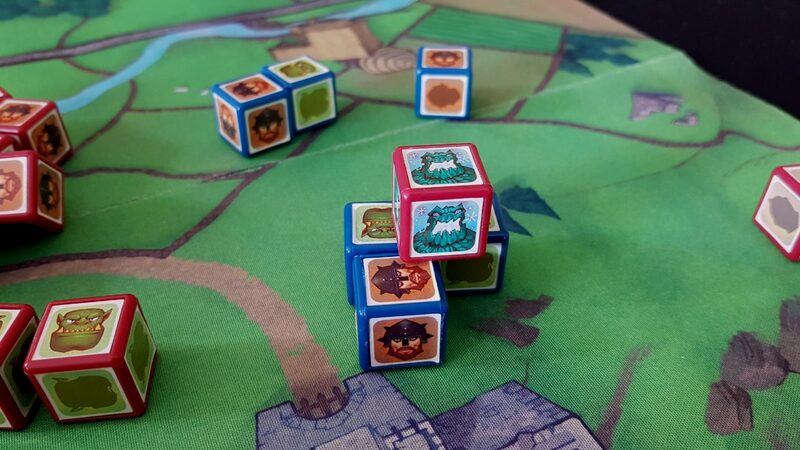 Each cube type has a different flavour to play – some are more resilient than others, some more agile, and some have special magical powers that can be spent when convenient. Oh, I was hoping for something more dramatic. The resilience of cubes is handled via the faces. Many of these have ‘shadowed’ sides – when one of your cubes falls into enemy territory with its shadow side up, it is ‘captured’. You roll that cube, and if a shadow side comes up again it’s discarded back to the box. Otherwise it’s ‘released’ and you get it back, placing it in your castle for future deployment. If it leaves the mat as part of its movement, it’s gone forever. All you can do is wave goodbye as your little soldier sails away and off the opposite side of the playing area without hitting anything on the journey. Your grunts have more shadowed sides, which means they’re fragile and flimsy – when they fall into enemy territory you’ve got a good chance of losing them. Strikers have only one side in shadow, so when they get sent into battle they’re probably going to survive. Even if they don’t you’ve got a good chance they’ll be released when you roll them. You don’t have to worry about shadow sides in your own territory which creates an instant bifurcation of responsibilities and weighted roles. Strikers are for attacking, grunts are for defending. And sometimes you’ll fail to find the correct balance between force and precision – your assault might end up setting your opponent up for a painful counter-attack. But not *much* more, it seems. It might seem like all you need to do is flick as hard as you can and eventually someone will win, but that’s the same philosophy behind ‘Hit the cue ball as hard as you can and it’ll be fine’ in a game of snooker. 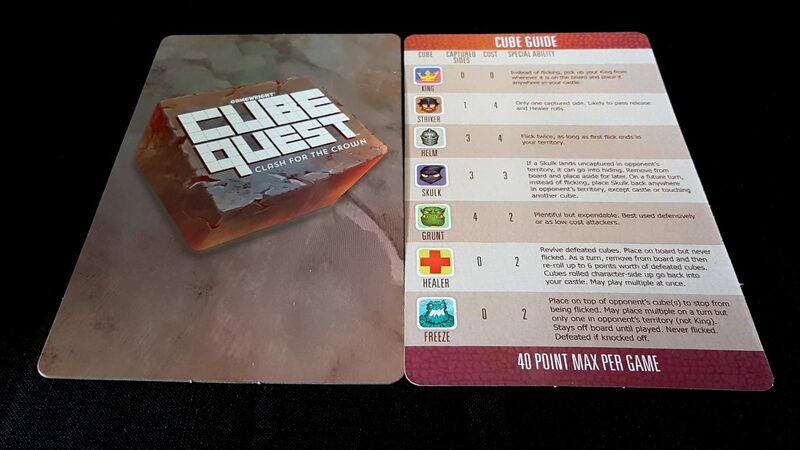 Cube Quest is a game of positional advantage, and that advantage will be yours, or it will be your opponent’s. 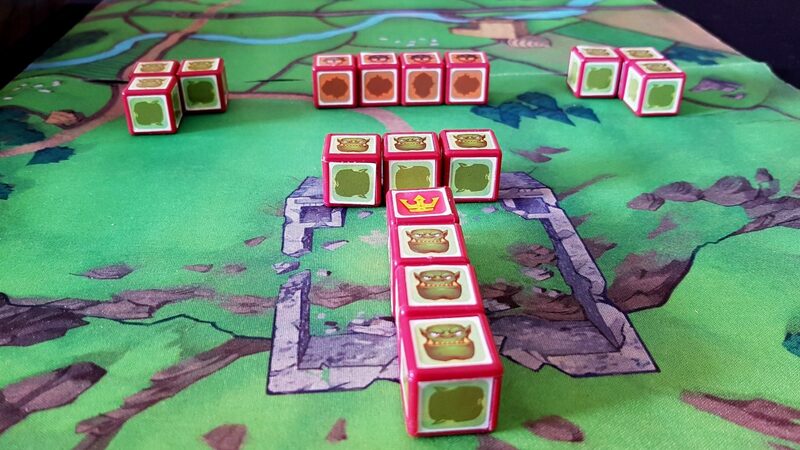 Force can be a useful tool, but it’s difficult to make use of it without sending your own troops rolling cheerfully to their doom. There are few experiences quite so disheartening as setting up the perfect attack only to find your striker sail into the air and off the edge of the table. Especially knowing as it happens that you’ve just ceded the advantage of position to your opponent. In games like this, if you’re not the hunter, then you’re the hunted. I can’t emphasise enough how often the tension between the competing forces of power and precision will be your undoing. Many times you’ll flick only to find that last minute hesitation does little more than cause it to ‘floop’ over with all the enthusiasm of a sleeping dog in the sun. Other times you’ll put just a little too much strength behind the attack, and it’ll go wide or end up doing collateral damage to your own positioning. 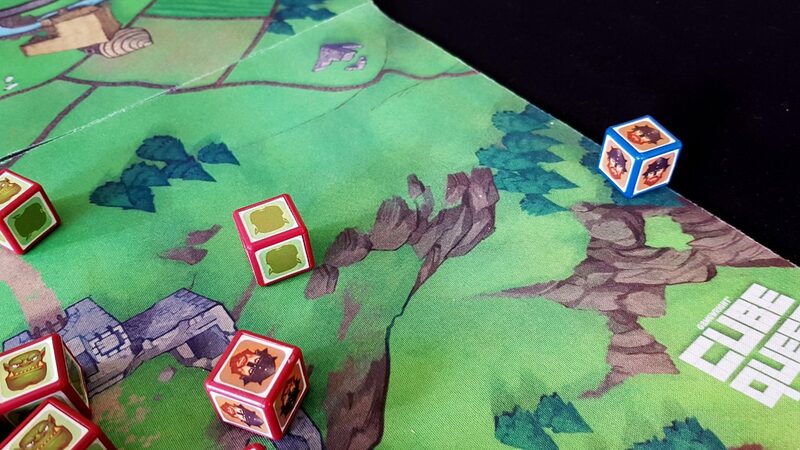 Friendly fire is common, and if your own attack knocks your cubes to the shadow side they’re just as captured as they would be if your enemy had done it. An over-zealous attack might send your target and your own cube off the side of the mat to their shared death. 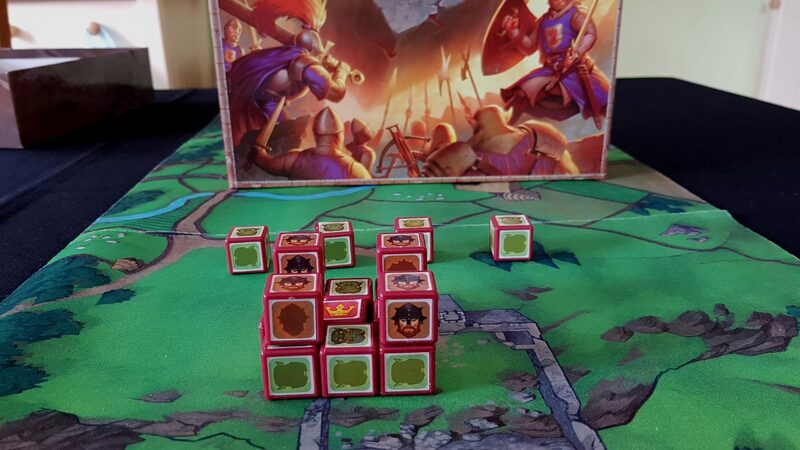 Sometimes all you’ll do is knock three or so of your own cubes out of play, especially when defending against an attack in tricky situations. Often you’ll only end up doing more harm than good, and you can easily knock your own soldiers out of play with a ham-handed flick of the wrong cube in the wrong way. The great thing about all of this though is everything is so quick and easy to set up and play that you can roll through a five games in a half-hour. Once you knock a king off the mat you shake hands, gather up your forces, and then try again. And again. And again. You can keep doing it until you become bored, and the short play-time means that you’ll never have over-committed your enthusiasm. 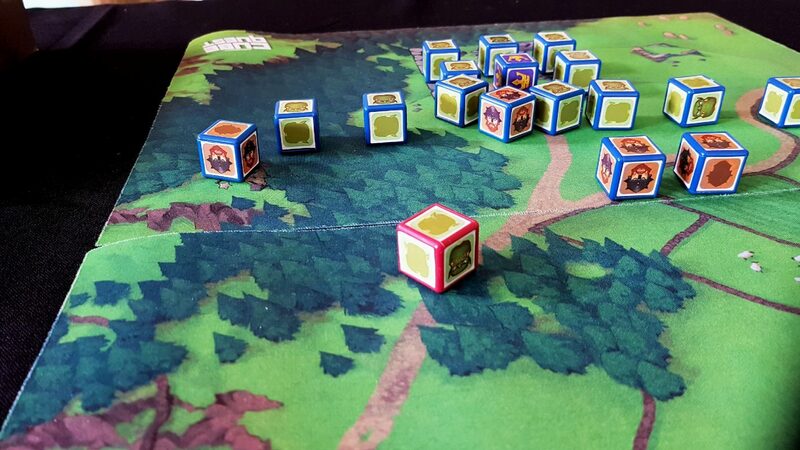 Once you’ve mastered the basic game, you can take advantage of the other cubes you can use in your armies. Helms can be flicked twice per turn, provided they end their first flick in your territory. Skulks can go ‘into hiding’ when they enter an enemy’s territory, being placed on the map in an advantageous position at a later turn. Healers can be traded in to recover dead troops, and the freeze cube can be balanced on top of other cubes to prevent them being flicked. If you want that freeze cube gone, you’re going to have to focus friendly fire on your own troops until it is knocked off. As long as a cube is pinned by a freeze cube, it can’t do anything of value. Clumping troops together is good defensive strategy, but it might be your undoing if someone can lock them down, forcing you to invest your own turns into undoing the curse. On the other hand, it can be a fixed defensive structure you can take advantage of yourself if you want to be clever about it. You can turn your opponent’s aggression into your own salvation. 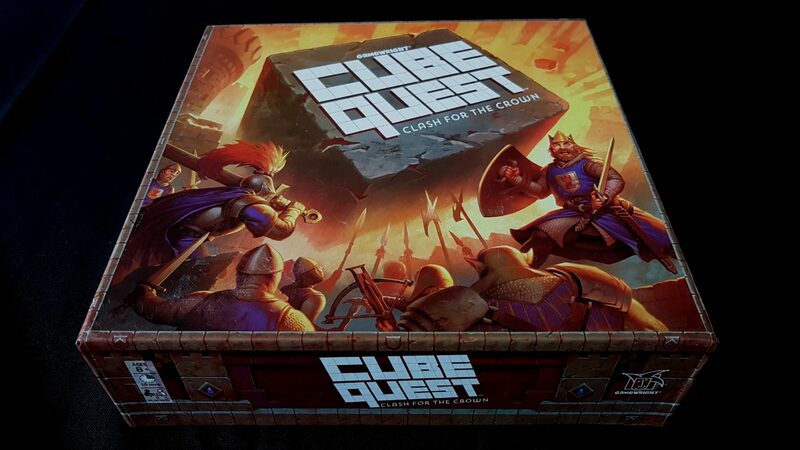 Unfortunately, that’s pretty much the only opportunity you get to be clever, because for all its frantic fun Cube Quest is a very limited experience. For one thing, the range of troops on offer is disappointingly small. You can tell just by opening the box that it’s going to need a meaty expansion pack to bring out its best. At the time of writing no such expansion is available. I’d go as far as to say that really it’s a prototype of a game that managed to get a big-box release. There is so much potential in the design that the missed opportunities are palpable. What about siege engine cubes? What about different shapes? What about different weight and composition cubes? What about physical terrain? You could wring a lot of genuinely interesting gameplay out of this by exploiting the physicality of the design without even worrying about layering new rules in. Metal cubes! Magnets! Irregularly shaped pieces! It’s really not enough to sustain the game beyond a handful of skirmishes. Even the asymmetrical armies you can build from a point budget don’t have the interesting interplay that would be needed to take advantage of the idea. In fact I’d go so far as to say there is no meaningful interplay at all. On top of this you have to layer the turn based system which removes all the real tension from play. You flick a cube, then they flick a cube, then you flick a cube. There’s very little peril, and no real reason other than positional redundancy to attack with more than one cube at a time. It means that instead of battles being fraught and exciting they’re more like a half-hearted tug of war that never really gets going. You can easily house-rule this away though – I recommend ‘one flick plus one extra per cube in the enemy territory’. That would allow players to set up interesting chains and flanking manoeuvres, and add a real sense of danger when you cede control of play to your opponent. 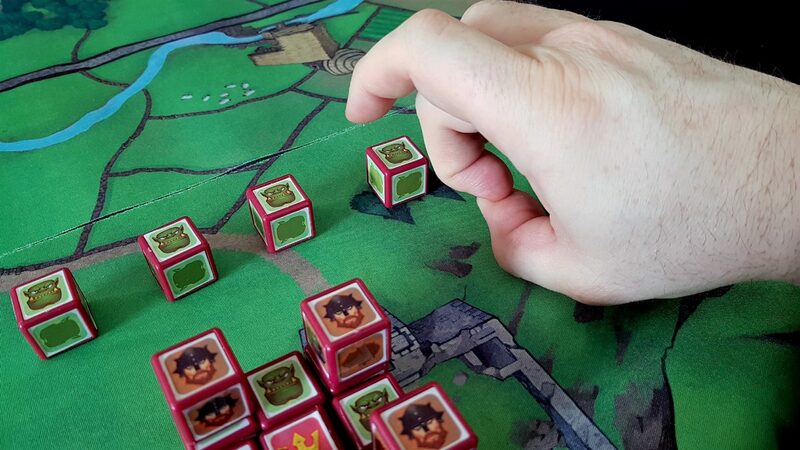 It makes play more interestingly strategic without much of an increase in rules complexity. 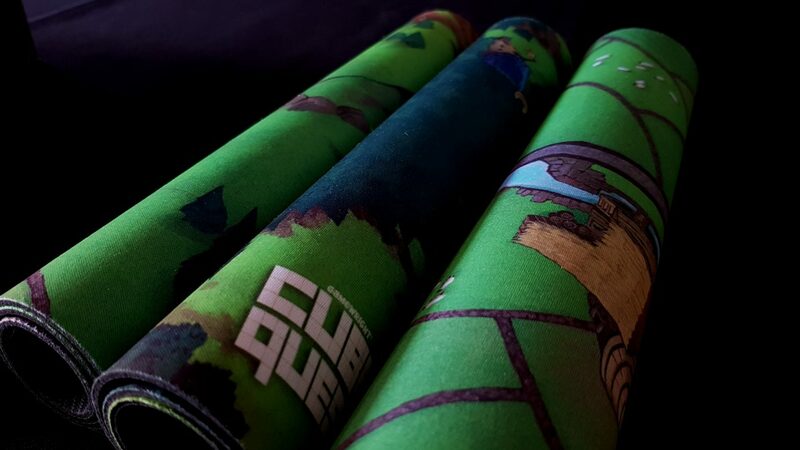 Cube Quest borrows its physical metaphors from pool or snooker. It has though managed to miss out on the key element that makes these games fun and interesting – the momentum of play which creates tactical flexibility. It nails the unreliability of physical placement within spatial constraints, but manages to miss the larger point. If a game’s going to be fun over the long term it has to have opportunities for interesting decisions and the execution of strategy. 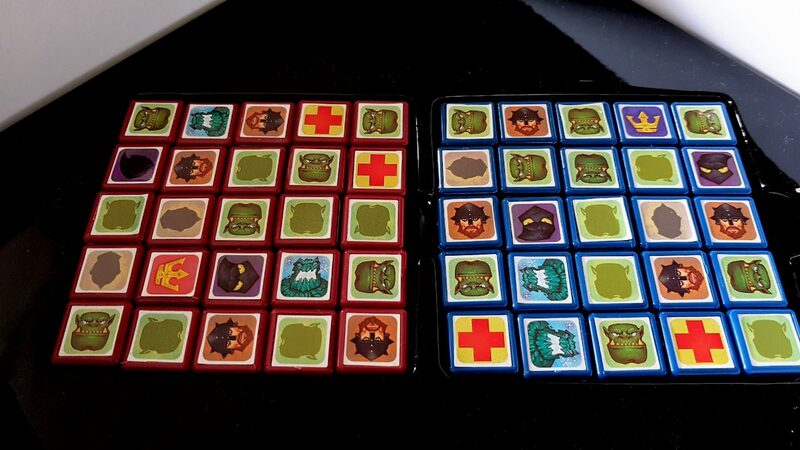 The decisions in Cube Quest are interesting for a while but you soon realise that you only ever paddle in the shallowest waters of the design space. It places most of the burden of fun on the muscle-decision of physical interaction. That’s fine but if you’re going to do that you need to make sure the rules bring out the best in that kind of play. Football is interesting (to some people) because a team can take possession and use that possession to get the most out of formations and positional roles. It would be a weaker game if one team kicked the ball, and then the other kicked the ball. That’s what we’ve got here. The final issue is that the components are just a bit – shonky. The mats need to be stored rolled up like olde-timey scrolls, and when they’re rolled out they don’t sit fully flat on the table. In a more interesting game with terrain and scenery that might have been cool, On a playing surface that is otherwise designed to be symmetrical it’s a problem that interferes with the physics of play. I have, on occasion, seen a cube that was destined for the grave saved by the curling edge of the mat. Again, you can house-rule a satisfying solution to these occasional annoyances but you really shouldn’t have to. 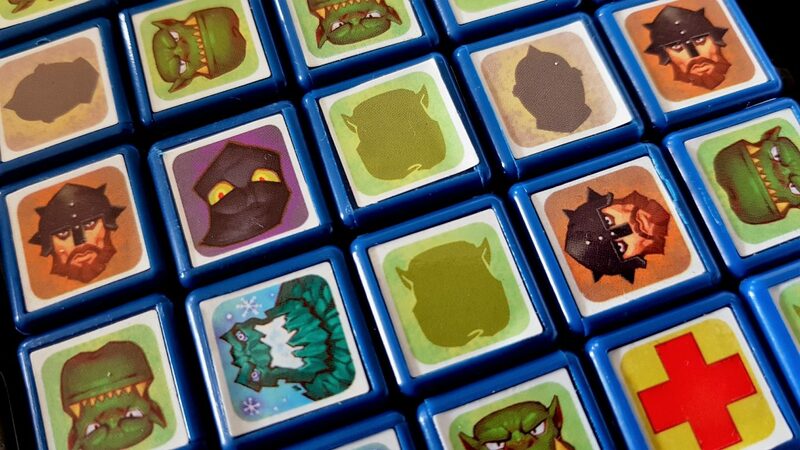 The cubes too feel cheap, and the faces start to peel off after only a few games. It doesn’t interfere with play, but it does feel like you might have bought the pound-shop knock-off of a game instead of the thing proper. That’s an impression forcefully underscored by the fact the neoprene map segments stink like the cheap mouse-mat you’d buy from a dodgy trader working an open-air market stall. I’ve mentioned several times you can fix (most of) these issues yourself – it’s a game that is extremely amenable to modification since the rules are very succinct and most of the play is physical. There’s nothing to stop you adding your own scenery from anything you find around the house. 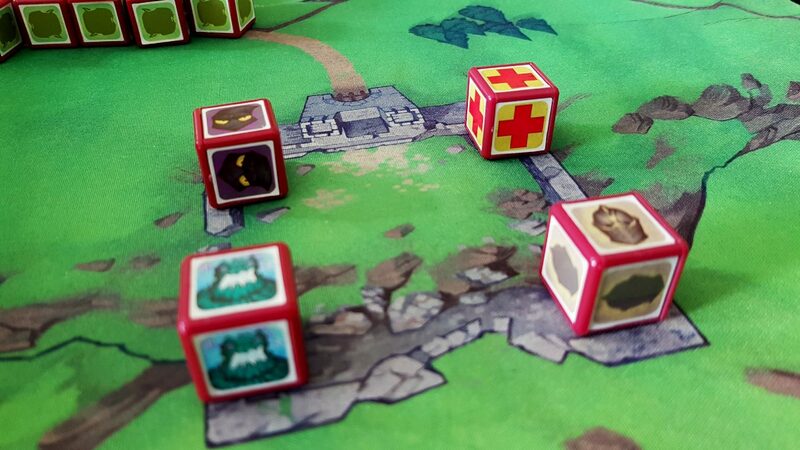 You can add in your own shapes – throw in random meeple, pandemic disease cubes. Hell, throw in a Rubik’s cube and see what happens. You can hang a lot off of the frame of Cube Quest. However, I’m not a believer that we should review a game in the form it could be with your own modifications. 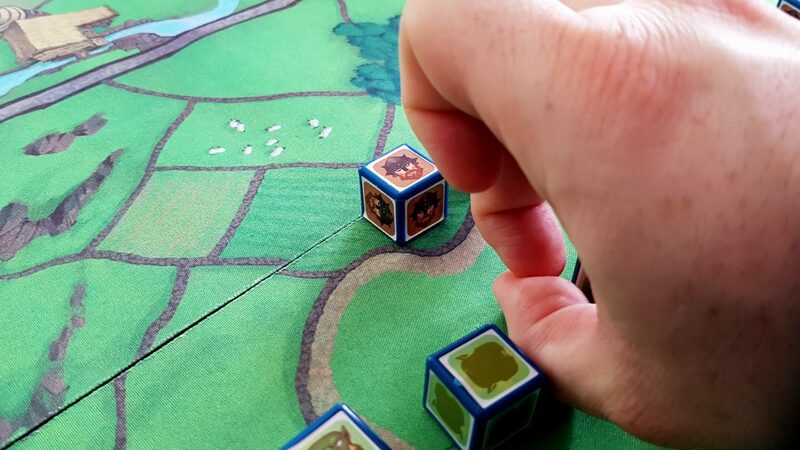 We review the game as it comes out of the box. While that game is certainly possessed of moments of great enjoyment it has a trajectory of fun over time that follows the curve of one of its flicked cubes. It begins strongly, loses speed rapidly, and then eventually plummets off the edge of a table and under the fridge, never to be seen again.